Truly great musicians defy categorization. They often defy adjectives as well, which makes them difficult to write about. 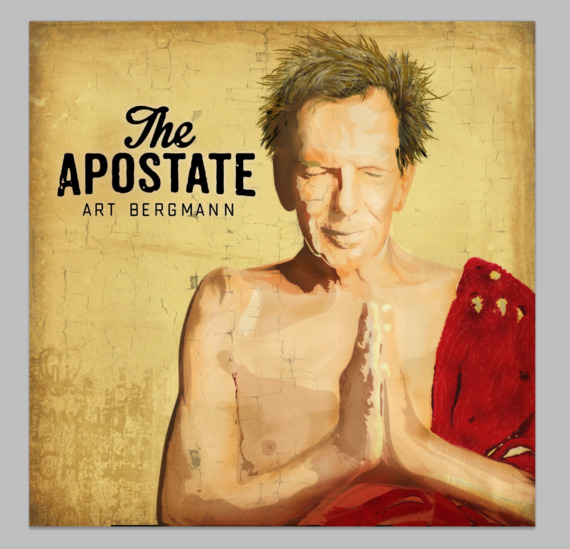 That is where Art Bergmann lies: between the facts and the superlatives. Very little of his solo music can be described as 'punk', though that's where his roots lie. He was 'alternative' when that actually meant something, back before it became just another commercial category. And those terms are the closest you'll get to genre-fying him. You can't even say there's an 'Art Bergmann' sound, because each of his albums sounds different from the next. This latest is his most-different yet. Atheist's Prayer sets up the album nicely. It has a psychedelic swirl alternating in stereo. The instruments are so blended that it is difficult to identify any particular one. The production is reminiscent of 70s cosmic tunes, except for the tone. Age of Aquarius cosmology called for universal enlightenment of humanity. Atheist's Prayer begs the cosmos to stop flawed humanity from spreading: stardust consume evil us. Art describes his current sound as "Country & Eastern." Two songs in particularly exemplify that. One is Mirage. The other is Pioneers. Both combine instrumentation that spans the globe, but not in typical ways. 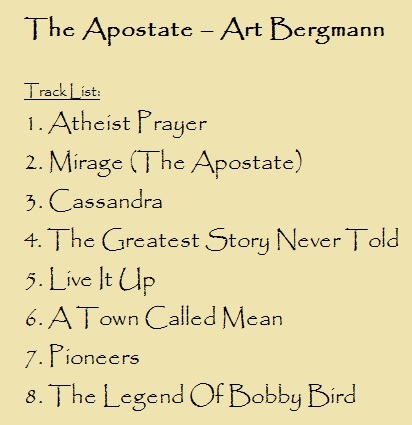 Mirage (The Apostate) is my favourite track of the eight. The schoolgirl-chant and clapping evokes urban playgrounds. The folk instrumentation reminds me most of dervishes; it seems to stretch across all of North Africa, across the Middle East, up through Turkey and down to Pakistan and India. The drums and lead guitar are pure rock. "The Apostate" in the title is not a person but an adjective, and this song is that: a rejection of musical conventions. The refrain desperately begs relief from horrors spawned by religion: "give me the peace from before birth, give me the peace from after we pass, give me the peace from before the first, give me the peace from after the last." That line, along with other others, is taken from Death and the Dervish by Bosnian author Meša Selimović. Mirage is serious ear-worm material. What is most striking is the way all the disparate parts of the song combine to form an uncatagorizable sonic beauty. Pioneers does the same, but almost inverted instrumentation wise. Where Eastern sounds dominate in Mirage, those instruments create the backdrop in Pioneers. As you pick apart the instruments, you discover hand drums and droning right out of India, but combined as they are, they create the trail dust of a Western film. The violin is less cowboy and more Acadian-Celtic (going east the other way from Alberta). Pioneers is a 12 minute epic and like a spaghetti Western, it'll leave you both satisfied and wanting more. Lyrically, Pioneers is an indictment of the pop-culture Old West. It starts with the real history of genocide against Indians, and ends at the Stampede: "Yay! We are the rodeo! Celebrate slaughter is part of the show." Three songs have been released already. Mirage was a February sneak-peek. A version of The Legend of Bobby Bird, Art's tribute to a casualty of the residential schools, was released as a demo last August. That's wasn't to promote the album, which hadn't even started recording, but to help drive home what was done to First Nations' children and how they suffered. The song is endorsed by Bobby's family, who helped Art with their language. Here's the article that inspired Art. The third release is Cassandra, which explores how women are subjected to violence and sexual assault. In ancient Greece, Cassandra was a princess and prophet who Apollo raped and cursed so none would believe anything she said. Art put the song out in disgust, in response to the Ghomeshi verdict. Art credits his wife Sherri Decemberini with the opening line "I'll never know how it feels to be a woman" -- and thereby moving him out of mansplaining and into lecturing his fellow men. Track 5 is sage wisdom from Professor Bergmann to the young punks: "Live it up, you're gonna die." It's a straight up 4-on-the-floor rocker with a catchy chorus. The lyrics are classic Art, full of vivid images and twisted meaning. Art once helped out punk band Psychomania with their anthemesque Fun If It Kills Me. Live It Up is an excellent companion to that: Art singing from both ends of a lifetime, with the same attitude. The Greatest Story Never Told is more classic Bergmann. Absolutely no one crafts a love song the way he can. This is the story of Art & Sherri, and the rumours told to and about them. Sherri gets another opening-line credit here. Pedal steel is used to a fine dreamy effect. The accordion adds a slight French flavour. Spirit of the West fans may hear echoes of Faithlift. If you liked Your Cold Appraising Eye, you'll love A Town Called Mean. It's a country-blues murder ballad. There's fantastic interplay between guitar and piano. Lyrically, the town is anyplace where greed and narrow minds combine into a right-wing mob. This is a magnificent album. 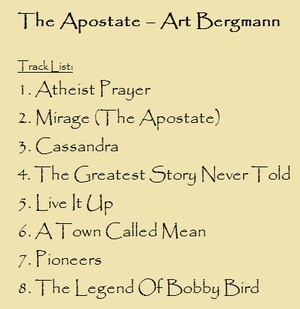 Both Underclass and The Apostate showcase Art Bergmann's songwriting gifts. More than ever, his songs are poignant, biting, and powerful. These recent works show a fantastic polish and patina -- if there's grit, it's there for a reason. That may be the biggest difference between this and his earlier works. While his talent hasn't changed, Bergmann has improved his crafting to levels unattainable by most. Special recognition has to go out to Lorrie Matheson. Lorrie doesn't so much "produce" Art as he does capture him, give him his shots, clean and tag him, and send him back into his natural habitat. Lorrie also provides a lot of instrumentation for the album. Art has a bunch of highly-skilled musicians supporting him on here. Check them out. So where does The Apostate fit? It goes in your library right next to Patti Smith's Gone Again. I think they'd complement each other nicely. You can get the album now as digital download from iTunes, Amazon, and Google Music. Hard media -- both CD and vinyl -- comes out on May 13th. I may have given the impression this is a morbid, depressing album -- it isn't. Bergmann approaches these subjects like Caravaggio. There's beauty here, and truth, and the enlightenment that can only be wrought by a master. The Apostate is fine Art.